Hi Jamie, I don’t recommend freezing it unless you leave out the noodles as pasta in soup tends to turn to mush after freezing. Absolutely delicious!!! I didn’t have all the ingredients on hand, but this was still Ah-Maz-ing (even without the half and half/cream). I doubled the recipe and we can’t wait to have leftovers. Thank you for sharing and for your creative efforts to create such a delicious soup. You are so welcome Bianca, I am so happy you enjoyed it! Thanks for taking the time to comment! Wow, another fantastic soup from your site! This is super delicious! This makes A LOT of soup. I ended up pouring it into a larger pot! I don’t have too much to say about the recipe except follow the directions. I will say that that noodles should be broken smaller than you think they should for easier eating. I didn’t think the pieces I had were too big, but they definitely grew a lot. 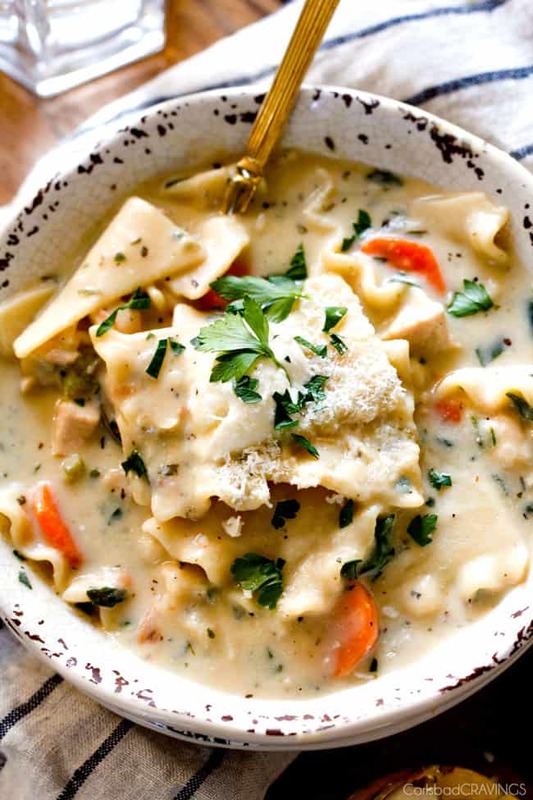 It has a good combination of flavors and it’s perfectly creamy. This is a keeper for sure. Be making this this week regardless of the heat. Thank you!! Awesome Nicole, I am so happy your family loves the original Lasagna Soup, thank you! And yes, I hear ya, its been so hot – in the 90s last week?!!! – so I am making a lot less soups – actually less than in the summer – hahaha I hope your family loves this version too! This is so incredibly delicious! Going to either cut the recipe in half next time or feed the entire neighborhood – it makes a ton!!!! LOL! I bet the neighborhood wouldn’t mind – but I should make a note to that effect :). I am so happy you loved it so much! Thanks Katie!! This looks amazing and I want to make it to bring to a friend who just had a baby. Can I make it the morning and give it to her in the evening or even make it the night before? Hi Catrina! 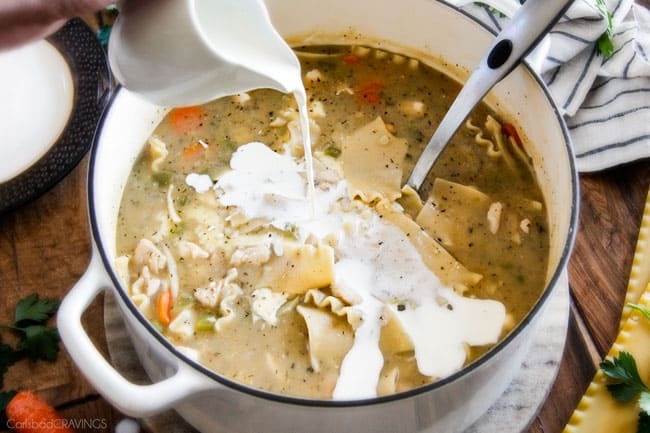 You definitely can make this soup the night before just be sure not to overcook the noodles and be aware that the noodles will soak up a lot of liquid sitting overnight so you will need to add more liquid when reheating the soup the next day – still tastes great though! and you are so nice to do that for a friend! Thank you! 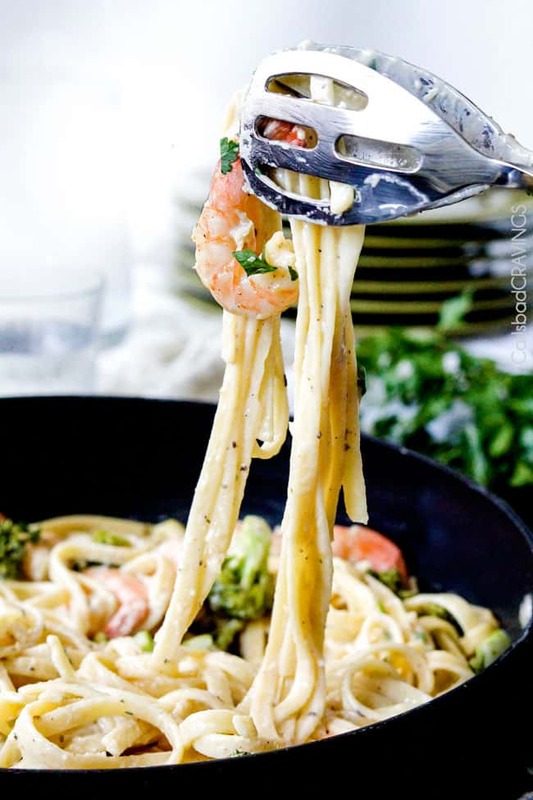 I’m also wondering if it would be better to cook the noodles separately and keep them separate until right before I bring it, what do you think? Hi Catrina, yes that definitely would be better! If you do that it should be perfect! If I use the oven ready noodles would that shorten the simmer time? Hi Josie! Great question! 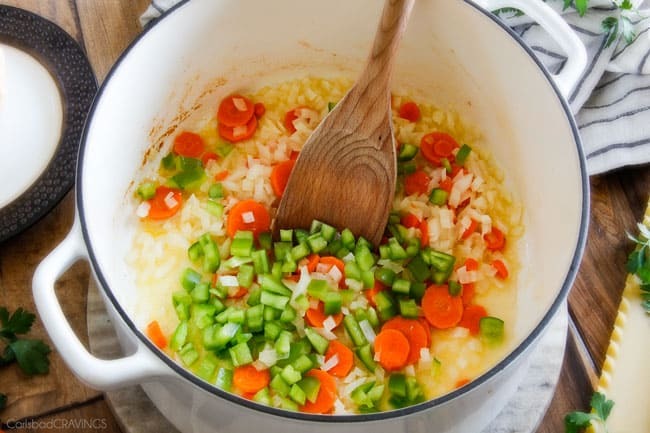 It would shorten the time but for maximum deliciousness I would not suggest using those because you want the soup to simmer for that length of time to develop the flavors and to thicken. Hello. I was wondering; I know you said not to worry about the noodles not being uniform or perfect but yours seem to be perfectly cut pieces. Can you advise how you did this? 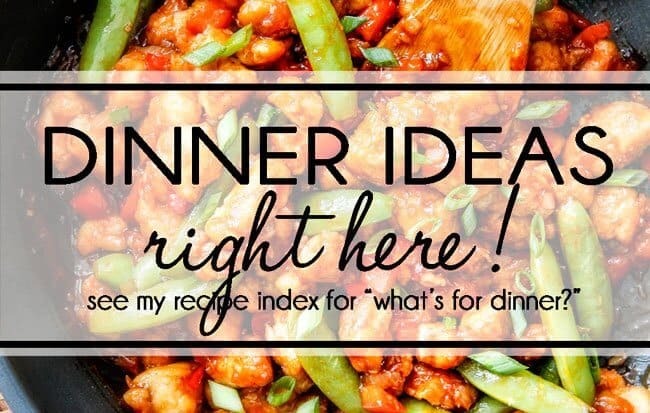 I’m so excited to have discovered your blog, it’s only been a few days and I already have a list of your recipes I want to try- 30 min maple Dijon chicken skillet, million dollar mac & cheese, chipotle maple chicken, and mini peanut butter pies are next on my list to make! I’m having a blast reading all the recipes and comments, especially because you come across as such a sweet and friendly person. It’s very refreshing to see that on a blog nowadays!! Wishing you a blessed 2017! Hi Lauren, WELCOME to my blog! I am so happy your first recipe was such a success! 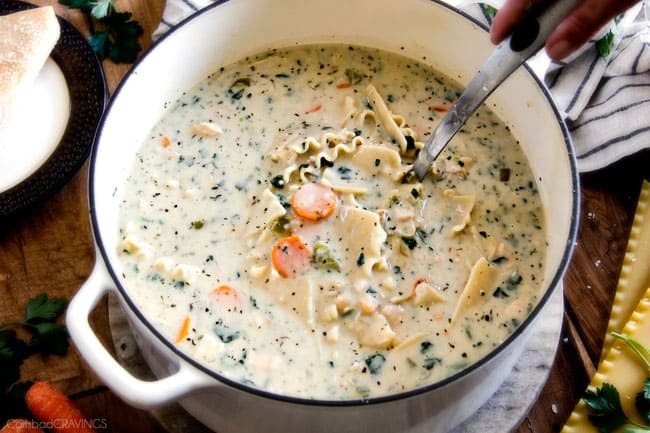 I love that you had it for dinner three days in a row 🙂 I love soups for that reason – the leftovers just get better! Your list of “to make” recipes sounds delicious – I always love hearing what immediately catches people’s eye/stomach 🙂 Thank you so much for taking the time to comment and for your thoughtful words! I hope you continue to love my recipes and I hope to hear from you again! 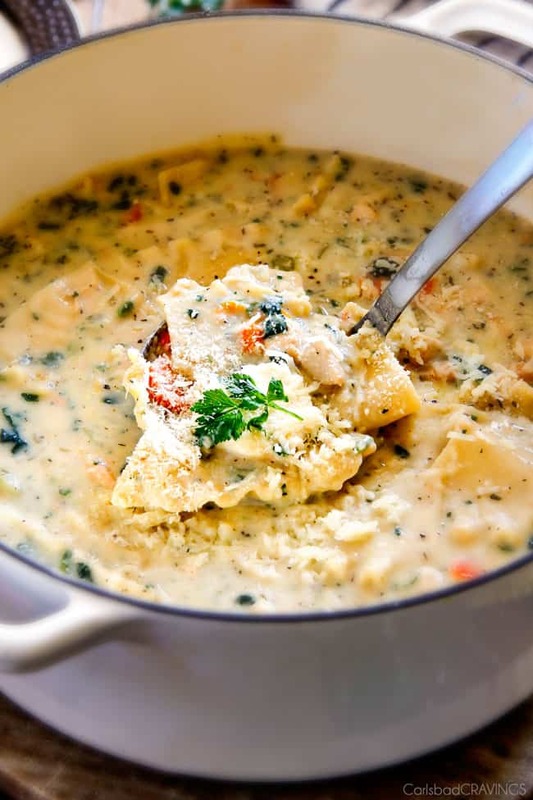 Just made the White Chicken Lasagna soup…..OMG Delicious!!!! haha! YES! So happy it was a hit! Thanks Kelli! As the recipe stands written for 8-12 serving about how much can I expect per serving? Are we talking a bowl full or 1/2 cup portion sizes? Hi there! We are talking a small bowl full. Hope that helps! I made this a month or 2 back and LOVED it!! My neighbor friend and her kids did as well! Its what is on the menu for tonight and I can not wait!! 🙂 It’s one of those you eat on any time you’re hungry for the next few days till its gone!! 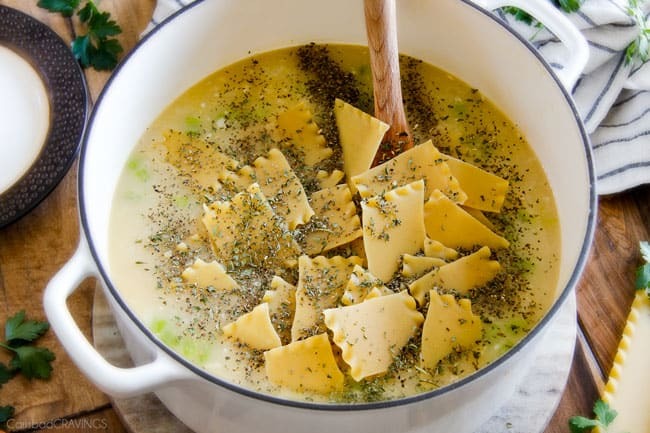 Awesome Desiree, I am thrilled this soup is such a hit with your family as well as your neighbors! And love your description – that is exactly how I feel about so many recipes – they are the only food I can think about and the only food I will eat until they are gone! love it! Thanks! Yum! Soup is definitely good food, and since it is 15degrees where I live, it hits the spot. Can’t wait to try it. Thank you for sharing. I want to start with the white chicken lasagna. 15 degrees?! ayiyi! 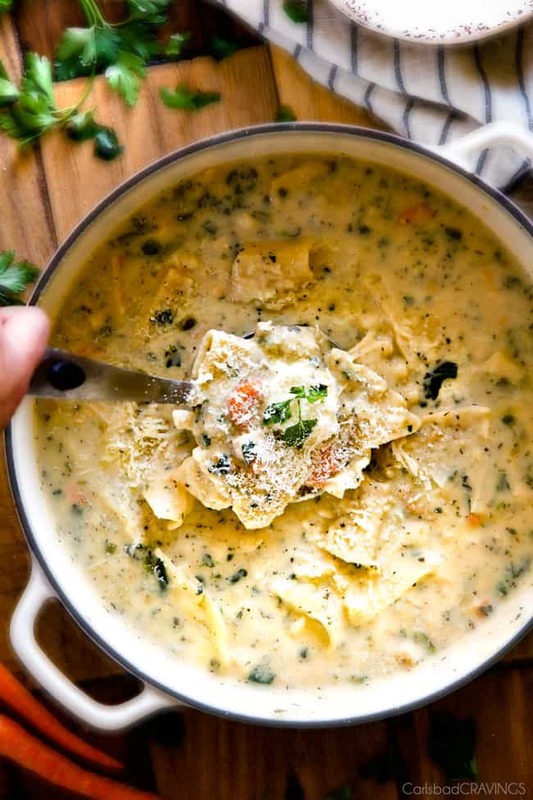 I hope this soups warms you body right up and makes your tummy happy! Can’t wait to try! I have a couple questions though. Im no expert in the kitchen (although soups/chilis are my jam) so I’m wondering what “divided” means for the olive oil and chicken broth. And can I use fresh spinach instead of frozen? Hi Kelsi! Divided simply means that you will not use the total measurement all at once – use part of the measurement in one part of the recipe and the rest of the measurement in another but it will tell you in the directions how much to use when. You can certainly use fresh spinach in the recipe if you prefer – I think that is just a personal preference thing. 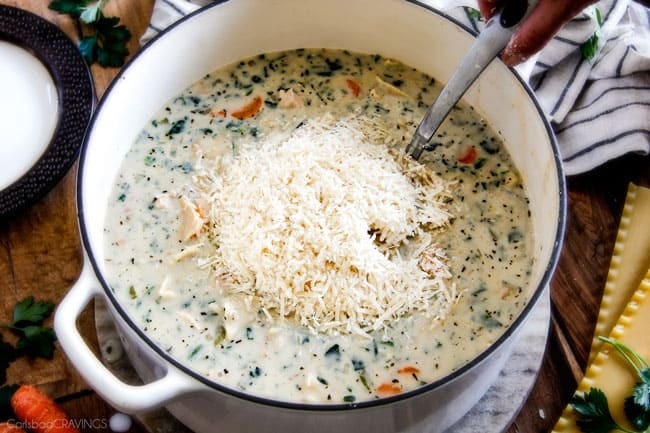 The chopped frozen spinach I would say blends more into the cream base of the soup while fresh spinach will probably feel more like another substantial soup ingredient, if that makes sense. Hope that helps, enjoy! That is AWESOME Kristin, thank you so much! I am thrilled your entire family loved it and hopefully it is helping to keep you all warm! I made this tonight …and OMG i want more . 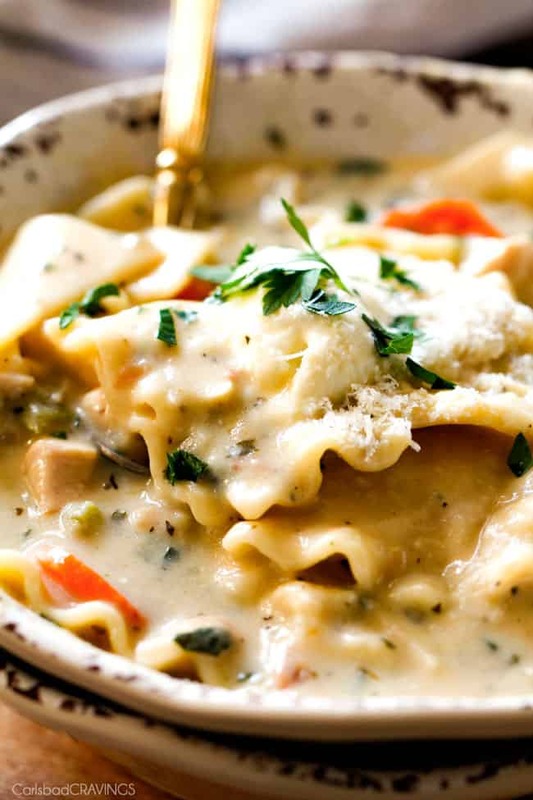 Two thumbs up and two bowls down…in my belly .awesome recipe! The only thing i changed was I used radiatore pasta. Iddy biddy lasagna noodles!! yes! love that reaction! And radiatore pasta sounds perfect! Thank you Tracy! This is seriously one of the best things I’ve ever made! I swear it’s like crack. I’m going to share the recipe with my son as I know he and his wife will devour it. Thanks for sharing so many yummy foods with the rest of us food-creativity challenged folks. Awesome Trudy, thank you so much! I love that YOU love it so much :)! I love sharing my creativity with appreciative eaters like yourself!! This is the best soup that I have ever tasted, not to mention made! 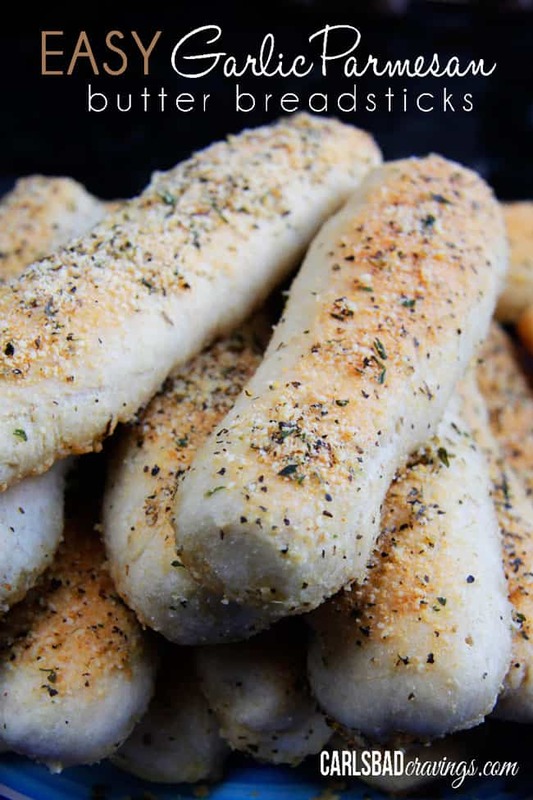 Very simple recipe yet complex flavors. My family loved it! Thanks for sharing this wonderful recipe. You are so welcome Lana, I’m thrilled it was the “best soup you ever made/tasted” and that your family loved it!! Thank you so much! I made this tonight and I thought it was delicious. I subbed some frozen veggies – corn, carrots, peas, green beans – and it came out great. I’m wondering if the leftovers would made a good filling for a pot pie. Maybe just thicken it up a bit. Any thoughts? Thanks for the inspiration. Hi Christy, your addition of frozen veggies sounds delicious! I think the filling would be delicious for pot pie! You could whisk in some cornstarch while its cold then bring to a boil then reduce to a simmer until thickened. Enjoy!